My son turned 7 this summer and is still living in the room he has been in since he was a baby. The room itself is a decent size and has more than enough room for him, his bed, desk and few toys. However, the decor is something to be desired. The room that my son occupies was decorated by the people that lived in the house before us. While Winnie-the-Pooh is great for a baby or even a child up to the age of 4, it isn’t in the forground of interests that my 7 year old son has. So, we decided that this is the year we will redo his room! The first step for my husband and I was deciding on a theme. We wanted something that wouldn’t be too bold and would be able to grow with him. Right now he is completely into superheros. There was much discussion on what color the walls would be. Red? Blue? Black? Green? How dark and bold did we want it to be? After careful consideration, we came up with a plan that we think would work well. 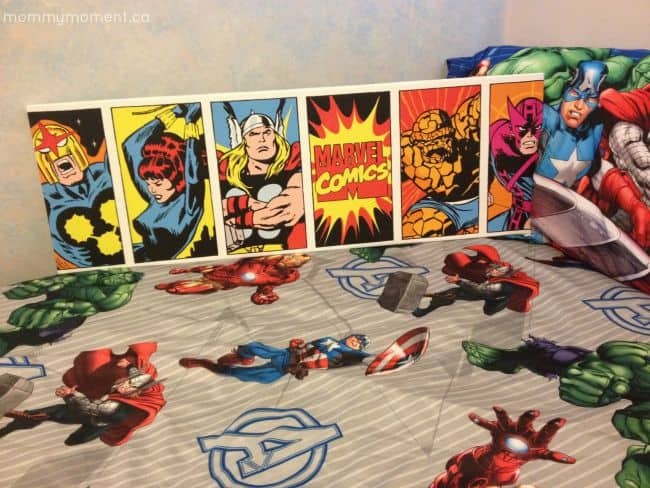 One wall will be painted a fabulous blue that can be associated with many different kinds of superheroes and purchased a superhero bedsheet set. 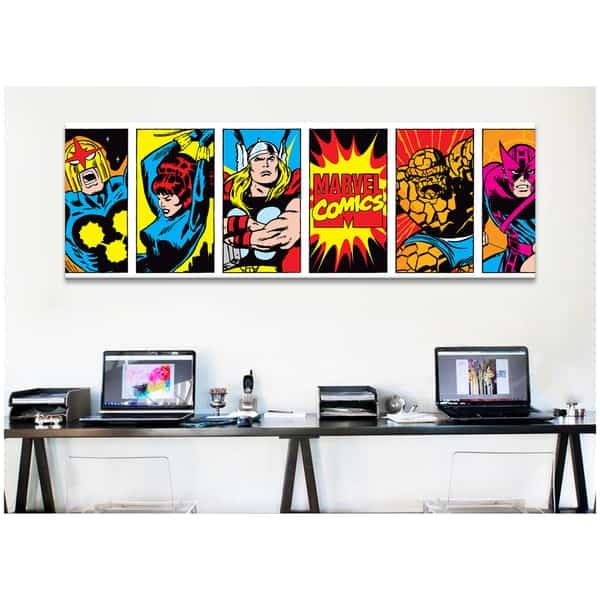 The main piece of the room that will draw your eye, is a Marvel superhero canvas art piece featuring 5 superheroes and a Marvel Comics logo! This artwork is crafted with 100-percent cotton artist-grade canvas, professionally hand-stretched and stapled over pine-wood bars in gallery wrap style. Because of it’s fade-resistant archival inks you can be guaranteed colour that remains vibrant for decades even when exposed to strong light. Ready to be displayed right out of the box, including free Hanging Accessories and instructions for a quick and easy hanging process that achieves the best positioning results. Quality Wood Bars: Shrink-resistant wooden-bar frame with tensioning wedges that allow for tightening of the canvas from the reverse side. I think my son will be surprised and estactic when he walks into his room and sees this fantastic surprise! Check out other fabulous canvas art from O.co. I think the decoration you did for your son’s room will make him or most young boys very happy. We all love to have heroes. Mine is Mother Teresa. Young boys like these ‘super’ heroes and they are a good example to follow in certain ways. I love the cartoon pictures and the bedspread. I love this idea for my son’s room!